I have spent a large part of my graduate and post graduate years putting in the word “Indian” in application forms that asked for my religion and caste. Don’t know if application forms are different in India now but at that time my friends and I were irritated to no end by the fact that secular institutions in the country were still collecting information on religion, and worse still, our castes! What we did not discuss was how easy it was/still is to smoke me out as a Maharashtrian Brahmin. The mere whiff of Varan Bhath – or Valan Bhath, as we ironically maintain our childhood lisps – is enough to transport me and my fellow Mahrashtrian Brahmins to heaven. A large part of our childhood has been spent eating this stuff comprising boiled Toor (split yellow peas) lentils flavoured with asfoetida and turmeric, on a mound of rice topped with a spoonful of ghee or clarified butter. It is served with a wedge on lemon and a spoonful of salt on the side. This is comfort food at its best – it is bland, nutritious and full of protein. It can be eaten with relish by a 8-month old or an 80 year old and is also the first thing that you eat in a Mahashtrian wedding meal – probably symbolically connecting you to the childhood that you are just about to lose. I don’t know about you – but this is what I am having for dinner tonight. 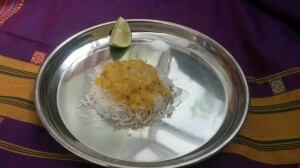 A Maharashtrian dish of yellow split pea lentils on a mound or rice with lemon and salt on the side. I normally use a pressure cooker to cook the dal. It's quicker! Mix all the ingredients together and bring to boil until the dal is soft and mushy. Make a mound of rice, put the varan on top. Add a dollop of clarified butter (ghee) and serve with a slice of lemon and salt on the side. 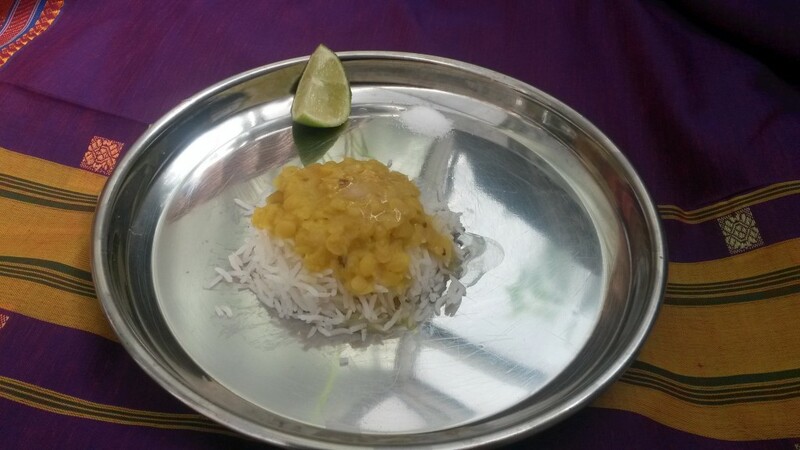 This entry was posted in Recipes from our kitchen and tagged curry, dahl, dal, dal rice, Indian food, indian recipe, Indian recipes, maharashtrian food, maharshtrian, marathi, recipes, varan, varan bhath by Poornima. Bookmark the permalink.